We saw this trailer yesterday when we went to see, "UP". It looks phenomenal. I'm thrilled to see Disney stepping into 2D animation again! I remember being there as a kid and actually getting to watch them work on, "Aladdin". That was when a good deal of the animation department was still actually housed in what was then, "Disney's MGM Studios" and what is now, "Disney's Hollywood Studios". We can only hope for a return to age of hand-drawn animation. Although, didn't it used to be called, "The Frog Princess"? What happened to that title? I like the new one better, I was just curious. After that, it looks like we'll get this. Though I don't know if it's 2D or Pixar-style. I'm crossing my fingers for 2D. 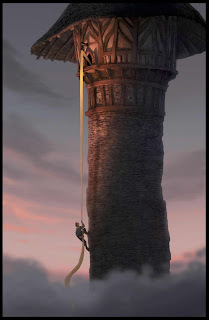 There have been a lot of changes to this project so far...word on the net is that it used to be called, "Rapunzel: Unbraided" and if you google it you can find a lot of concept art. It'll be fun to have these to look forward to!